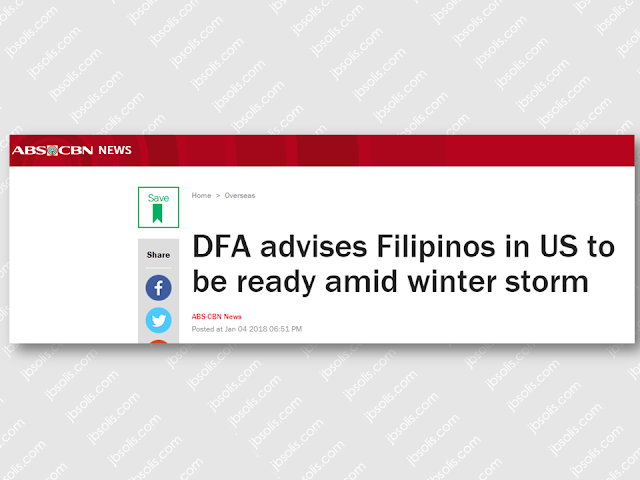 The Department of Foreign Affairs (DFA) advised Filipinos in Northeastern part of United States to prepare and be vigilant as a strong snowstorm "is expected to bring hurricane-force winter winds" and "6 to 12 inches of snow" in at least 8 states. 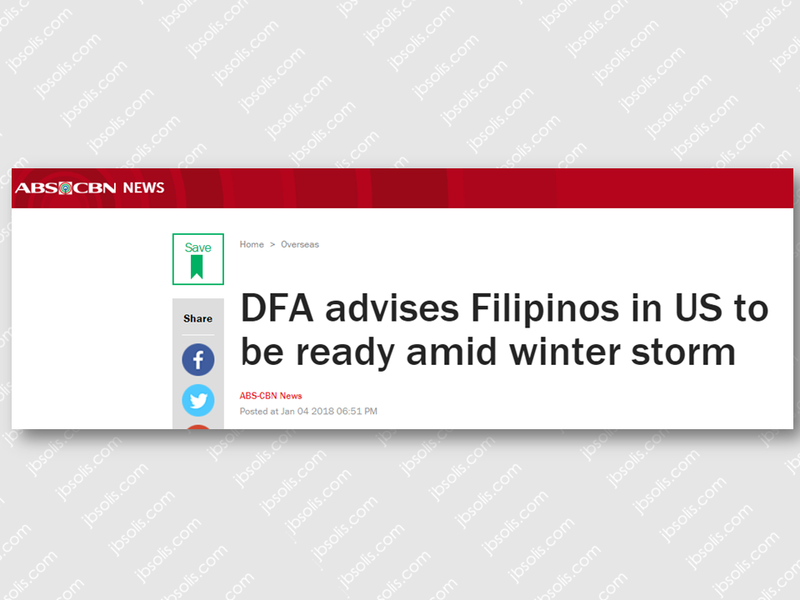 About 340,000 Filipinos living in the states of Maine, Massachusetts, New Hampshire, Rhode Island, Vermont, New York, New Jersey, and Connecticut may be affected by the "bombogenesis," the DFA said. 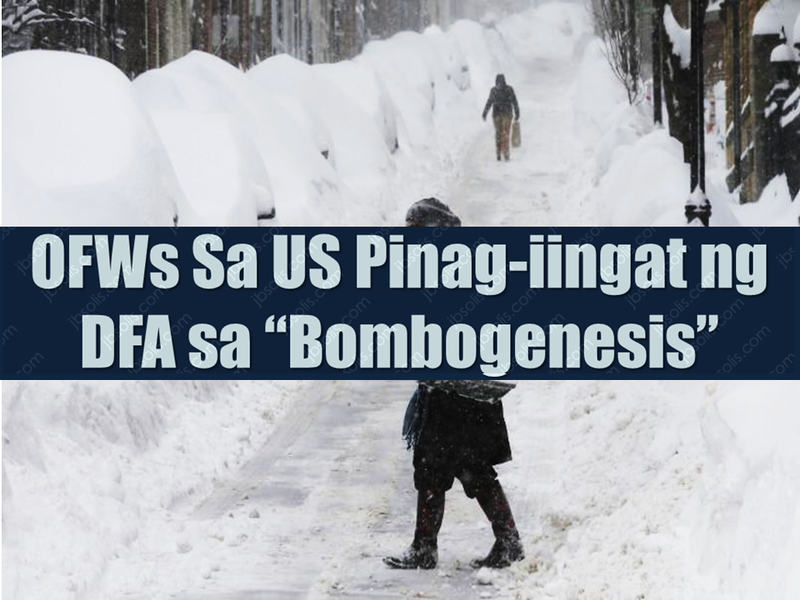 "Bombogenesis," also known as a "bomb cyclone," occurs when a storm's barometric pressure drops by 24 millibars in 24 hours, greatly strengthening the winter storm. "Filipinos in the affected areas are advised to closely monitor weather reports and to heed instructions of local authorities," Cayetano said. 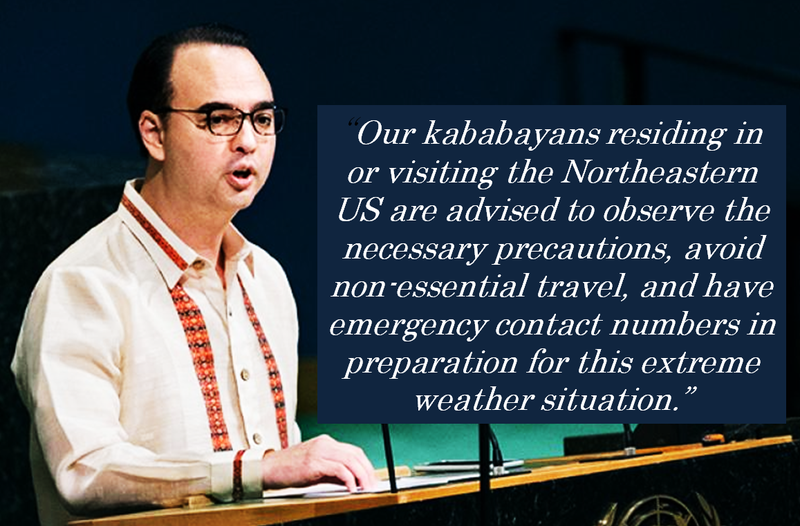 Philippine Consul General in New York Maria Theresa Dizon-De Vega said volunteers under the Consulate General's Warden System have been alerted to monitor weather conditions and to report any emergencies to the mission. A magnitude 4.5 earthquake shook up the San Francisco Bay Area early Thursday. It was felt throughout the region, and could be felt for perhaps five to 10 seconds. Near the San Francisco International Airport, several jolts could be felt. The epicenter of the earthquake was recorded along the Oakland-Berkeley border, just north of the Claremont Hotel. It is in the area of the Hayward fault, one of the most feared in the Bay Area, which could produce a magnitude 7 or greater earthquake and is directly underneath heavily populated areas. San Francisco's emergency managers said all city facilities and infrastructure would be inspected Thursday, though there were no initial reports of damage or injuries.